DrayTek have been in the high-speed modem business for almost 20 years starting with ISDN adapters. Today they produce some of the most feature rich but affordable routers in the world. If you want a reliable and powerful router than can do almost anything straight out of the box, then check the Vigor range of routers. 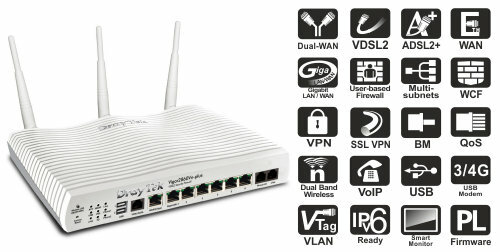 The 2860 can connect to modems, ADSL, ADSL2, ADSL2+, BT Infinity, Cable modems, Fibre modems and 3G/4G networks. On top of that it will allow the use of multiple internet connections either in a 'load balanced' or 'failover' configuration. It also supports multiple wifi networks on the 2.4Ghz and 5Ghz bands allowing both secure company wifi and public/guest hotspots (with bandwidth and time limitations!). If you're a network geek, just look at the technical specs! The connection between your high-speed router and your computer is just as important as your router selection. Wifi always seems like the best option as it's quick and easy to setup, but what it offers in convenience it lacks in speed and reliability (have you ever tried using a wifi connected printer or scanner?). Installing an inexpensive 'switch' and CAT5 cabling to your desktop is a sensible option, or perhaps cable in a separate wifi hotspot at the other end of the building to improve coverage. We are often asked to help resolve power socket connected network devices, we almost always upgrade to a dedicated CAT5 cable and have no further problems. If you've paid for high-speed Infinity, Sky or Virgin Fibre why waste it on the 'free' wifi router that comes with it?